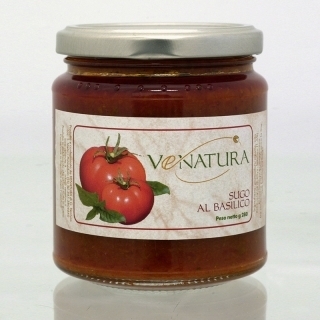 Made with fresh tomatoes and basil this cooking sauce will instantly give you that "Mediterranean homemade" flavour to a variety of your pasta and rice dishes. Try to prepare "malloreddus alla campidanese" with it... Just fry some onions with chillies and salsiccia sarda. Cook the malloreddus pasta and simply add the sauce next for a truly tasty meal! Ingredients: Tomatoes, onions, extra virgin olive oil, basil, parsley, salt.